Calcium, an essential element, plays a major role in keeping bones healthy and regulating nerve and muscle functions. Nearly all the calcium in your body remains in the bones and teeth, with just a small amount in the bloodstream. If you lack calcium in your diet, your body removes it from your bones and teeth to use in the bloodstream. Getting enough dietary calcium can be difficult if you don’t eat dairy products or canned fish, but a number of fruits and vegetables also supply calcium to your diet. Some people need more calcium than others. Adults ages 19 to 50 require 1,000 mg per day, while those over 50 need 1,200 mg. Children ages 9 through 18 and pregnant and breastfeeding women need 1,300 mg per day. Children between the ages of 1 to 3 need 700 mg daily, while children ages 4 through 8 need 1,000 mg.
All fruits contain some calcium, but the fruits with the highest calcium amounts include frozen rhubarb, with 266 mg per cup, and dried zante currants, with 124 mg per cup, according to Bayer HealthCare. 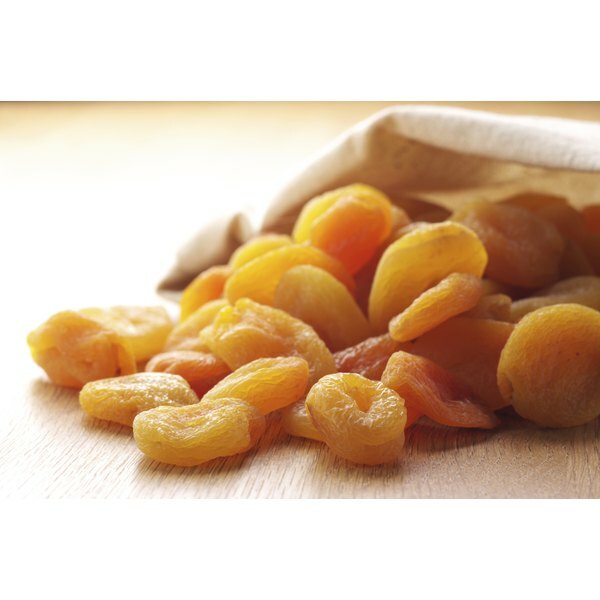 Dried fruits contain more calcium than fresh, with dried apricots supplying 72 mg, seedless raisins 73 mg, dried plums 75 mg and dried pears 61 mg per cup. A large orange supplies 74 mg of calcium, while 1 cup of watermelon supplies only 11 mg. Vegetables especially high in calcium include a number of greens. Boiled spinach contains 245 mg, collard greens contain 266 mg, boiled mustard greens 284 mg and mustard spinach 315 mg per cup. One cup of boiled soybeans contains 261 mg. One stalk of boiled broccoli contains 112 mg. One cup of boiled snap green beans supplies 55 mg. Your body absorbs calcium best when you take in no more than 500 mg at a time, according to the Office of Dietary Supplements. If you’re eating fruits and vegetables high in calcium in a meal, don’t take a calcium supplement at the same time, since you won’t absorb it all. Although taking too much calcium in the form of calcium supplements can increase your risk of developing kidney stones, getting excess calcium from foods doesn’t pose the same risk.